A suspected member of the Oudua People’s Congress (OPC) popularly named Demola, who was allegedly mobbed by irate voters in Ago Palace way, Lagos, for disrupting voting during last Saturday’s election has been confirmed to be alive. 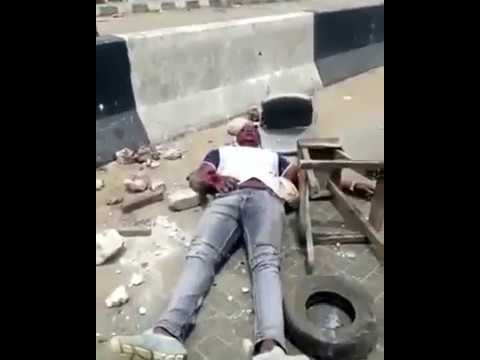 After a video showing Demola being hurled with stones went viral last Saturday, there were reports that he didn’t survive the ordeal and residents in the area feared reprisal attacks. But in a recent clip seen by our correspondent, he was observed lying on a bed with blood-soaked bandage covering his head while receiving treatment after being rushed to the hospital by some sympathetic residents in Ago Palace way. During the presidential election which held last Saturday, Demola was beaten and stoned was by some voters after he was seen among thugs who invaded polling units in the Ago Palace way allegedly snatching many ballot boxes and burning the votes already cast. Witnesses who saw the beating said that the voters were irked when they saw him among a team of thugs going to different polling units, snatching ballot boxes and burning ballot papers. They told our correspondent that while voting was underway in Ago Palace way area which is predominantly dominated by non-Yoruba-speaking residents, thugs suspected to be members of the OPC and the All Progressives Congress (APC), stormed different polling units armed with dangerous objects, chasing away voters, ordering some of the voters from the eastern part of the country to go back to their homeland. However, the Independent National Electoral Commission (INEC) has announced that elections would be rescheduled in areas where violence and ballot-box snatching was recorded in Rivers, Anambra and Lagos.